After a hard day's work, you take a break to admire your city through the large windows of your office at this hour, most of your citizens are going back home, heading for the tall buildings that you see in front of you. Some others are still wandering in the parks and gardens with their kids, and others decided to go shopping in the new mall that you opened a few weeks ago. In the distance, near the harbor, you can see smoke rising from factories' chimneys. Somehow, the city never sleeps. 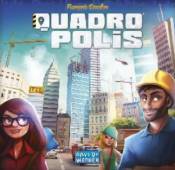 In Quadropolis you enact the role of the Mayor of a modern city. You will need to define a global strategy to build your city according to your Inhabitants' needs and outmatch your opponents, sending your Architects to have various buildings erected in your city. Each building allows you to score victory points. There are various types of buildings with different scoring patterns; many of them may be combined for better effect. Will you be able to meet the challenge and become the most prestigious Mayor in history.